How to Conduct an AGM in your Apartment Complex? If you are looking for sample AGM notice template for residential welfare association or apartment owners association, download from here. The Annual General Meeting (AGM) of a Residential Complex is a yearly event held to discuss the major issues facing the society and to collectively reach a consensus on the best solutions possible. Ideally, the AGM should be held before August 14th of a year (or as mentioned in bylaws of your association). You can extend this date by not more than three months after getting the permission of the Registrar of Societies. In case the Registrar is not convinced about the reasons for the delay in holding the AGM, Registrar may appoint an authorised officer to conduct the AGM at the cost of the society. Most of the topics discussed during the AGM will be related to policies, finances and the future course of action for the society. While any topic can be discussed in the AGM, certain topics like electing new members, appointment of auditors, any policy change regarding expense amounts, etc. can only be finalized during an AGM. Have an internal meeting of the Managing Committee to fix a date for the AGM. Make sure that it doesn’t fall on a holiday or a long-weekend to ensure maximum participation from members. Circulate the notice to all members of the society least 21 days in advance. Get the accounts audited and signed by the President, the Secretary and the Treasurer. Identify the auditors to be appointed and their remuneration for the upcoming year. Prepare of the Annual Report for the AGM. The annual report should contain the work done by the managing committee in the past year and the focus areas for the coming year. Circulate the Annual Report to all members of the society. Get minutes of last year’s AGM and make a list of all the resolutions passed in last year’s resolution. Make a list of all documents that will be presented during the AGM. Prepare for the questions given by the members. The committee members also need to take care of administrative aspects such as printing extra copies of the Annual Report for the day of the meeting, ensuring enough chairs for the meeting, make catering arrangement if you plan to provide any refreshments during the meeting etc. To discuss and approve the appointment of Auditors for the current financial year. Issues related to lifts, gardens, common areas, etc. Post the AGM, it is important that the Secretary of the association circulates the minuites of the meeting to all members so that all members are aware of the decisions taken during the AGM. While the Managing Committee has its responsibilities, the ordinary members too have certain responsibilities. As a member of a Residential Complex, it is your duty to participate in the AGM and contribute to the discussions. Any decision made during this meeting will affect the quality of your life in the society – so don’t leave the responsibility on the others. Before you attend the meeting, familiarize yourself with the Agenda; clear any doubts you may have regarding anything with other members or someone from the Managing Committee before the meeting. Make a list of questions that you plan to ask based on what you’ve noticed about the functioning of the society. Take a copy of the Annual Report with you to the meeting. And finally, be at the meeting slightly before time so that the quorum is reached and the meeting can start off as scheduled. We wish you a fruitful AGM for your society! A sample Notice for an AGM can be downloaded from here. This article aims at collating and providing information on bye-laws for residential complexes for benefit of ApnaComplex customers and readers. While ApnaComplex has taken every care to ensure the information is accurate, we suggest to please use the information in the article and the template provided only as a guidance for further discussion and action with help of relevant professionals. If you need professional advise on this topic and any other property related matters, please send your request through our contact us form. You may post your questions/inputs in the Comments section below and we will try and get them answered through relevant subject matter experts. With preference for nuclear families and staying independent increasing, getting old in India is slowly becoming a scary proposition. Without a regular income, senior citizens are finding it increasingly difficult to manage their daily expenses along with meeting the escalating costs of healthcare and other services. As more and more people are realizing, relying on just one’s savings or investments during old age may not be enough! So what are the options that a senior citizen has, to live a life of dignity? Are there any avenues open for them to earn a regular income even at their age? Till a few years back, these would have been very difficult questions to answer. But now, there is a ray of light for at least those senior citizens who own a house or apartment in their name. It is called Reverse Mortgage. The principle of Reverse Mortgage is quite simply the opposite of a Home Loan EMI. When you take a home loan for your apartment, you are expected to pay a monthly amount for a fixed period of years. In the case of Reverse Mortgage, the bank pays an EMI to the apartment owner for a fixed period of years. This EMI can be used as a monthly income by the home owners. The process of getting a loan on your home starts with your application. This is followed by an evaluation of your home by the bank. Depending on the prevailing rate at your complex and the locality in which it is based, the bank will reach a valuation for your apartment. The better the quality of your apartment complex, greater is the chance of getting a high valuation for your property. Once the valuation is done, you can decide on a tenure for which you’d like to receive the loan. Once the loan is availed of, the senior citizens can stay in their apartment and receive the payments from the bank till the end of the tenure. If the couple or either of them survives the tenure of the loan, they can still continue to live in their apartment till their death. It is important to note here that the bank cannot take possession if the owner expires but the spouse is alive. The possession changes hand only when the couple is no more – irrespective of who the owner was. Once the bank gets the possession, they can sell the apartment at the market rate and deduct the loan amount plus the interest on it. Any remaining amount will be handed over to the heirs of the home owner. There are certain conditions for availing the Reverse Mortgage, however. The maximum period for the mortgage is usually 15 years. Some offer 20 years though. The amount received is considered as a loan and not income. This ensures that the amount is tax-free in the hands of the senior citizen. Payments can be made in monthly, quarterly, or annual instalments. A lump sum payment could also be considered if the owner so decides. The banks can charge a fixed or floating rate of interest on the loan being disbursed. This will be adjusted against the sale of property at the end of the tenure or on the demise of the owner and his/her spouse. The concept of reverse mortgage is very popular in the West. But it is yet to find acceptance on a mass scale in India. One of the reasons could be the low awareness of the product. But probably the more important one is about perceptions. Although the advantages of reverse mortgage seem high (steady source of income, possession of house till death, etc. ), mortgaging ones property is yet a new concept for Indians to accept. Added to this is the fact that most Indian parents like to bequeath their property to their children, instead of using it up for their own purposes. What could change these perceptions is the changing reality of modern India. One of the realities is of children staying separately from their parents. Not just in a different house, but many children now settle far away – at times even in a different country altogether. Plus, many children are more often to sell off their home on inheriting it. The gap in geography also takes its toll on the emotional connect; it is not unusual to see the growing disconnect between parents and children of the present generation. All these factors could make Reverse Mortgage a more popular avenue for income generation for senior citizens. Today, most young couples put their life’s saving into their dream home. Many may not realize it now, but the apartment in which they are investing so much could well be their savior in their latter years. At ApnaComplex, today we have released a simple but very useful new feature to help secretaries of Apartment Associations in form of “Action Item Tracker”. In short, “Action Item Tracker” just does what it means – track action items. With this feature, ApnaComplex enables managing committees of apartment associations to formally track and monitor progress on various activities that are happening in the complex. One of the core issues that a resident welfare association faces is that things take forever to complete and the remedy is very simple – institutionalize a formal action item tracking mechanism. This makes the progress and bottlenecks to implement visible to every one and also makes all managing committee members more accountable. This exactly is what “Action Item Tracker” is expected to provide. The tracker is available to all Managing Committee Members. Action items can be created, updated, reassigned by any of the managing committee members and by the community administrator. Also, more often than not, all managing committee members will not be present for all the meetings. The tracker shall prove to be excellent way for committee members to keep every one else informed about the progress on an action item irrespective of they attending a meeting or not. Also, since the action items can be re-assigned to other members if needed – the new assignee can get all updates on a given action item will be at one place – instead of being present in multiple emails – making it seamless to move forward. Secretaries can now start every committee meeting by going through the list of “Open” or “In progress” action items making the meetings very focused and effective. Most importantly, it makes sharing information on Managing Committee achievements a breeze. All it requries is to filter all closed action items and send a report to entire community. Happy action item tracking and we sure hope to have made life little better for you! We all love to complain, don’t we? – We upgraded Complaint Box for you! We have released an upgraded version of the “Complaint Box” module of ApnaComplex along with host of other enhancements. 1. Administrators can now configure “complaint box administrators” for each category type of complaints. This will make it easier to assign owners for different aspects of managing the complex. 2. The “category owners” shall only see complaints related to the categories they own – the electrical guy no more need to even see the issues related to swimming pool. Of course, community adminsitrators can see all the complaints. 3. The category owners shall have the ability to reassign the complaint to a different category and/or to a different owner. 1. Closed complaints can now be re-opened by the originator or the administrator till specifed period of days after the complaint is closed. This has been the most requested feature till date and we are happy to satisfy the need now. 2. Residents can now provide feedback on the quality of the service provided on all closed complaints. Similar to the ratings of vendors in ApnaComplex’s Vendor Management module – the ratings will be on a scale of 1 (worst) to 7 (Best). Makes it very easy for managing committees to judge the real quaility of work. The ratings can be updated/changed till specified period of days after the complaint is closed. 3. 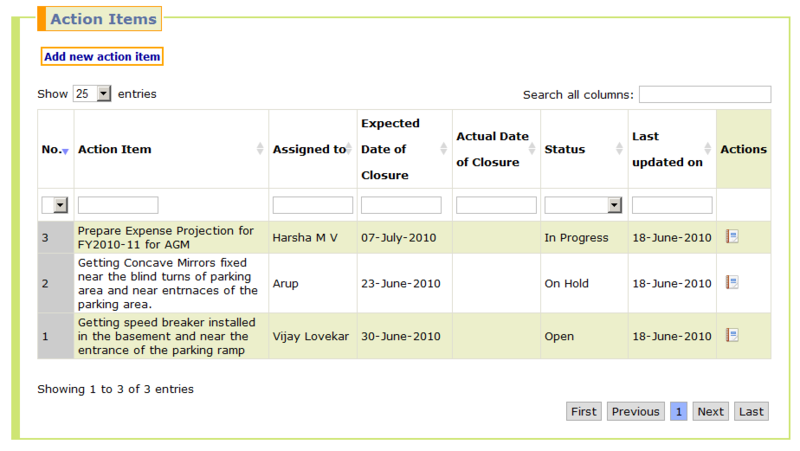 The number of days a complaint can be re-opened or rated after its closure is configurable by the communtiy administrator. 1. Administrators can now configure if mails related to community complaints shall be sent to entire community or only to the administrators. This is again based on the need for some of our customers. 2. Formatting changes to bring in more readability to all the automated mails that get sent as a part of complaint tracking. A complaint box has never been so easy (and actually fun) to search and sort. Users and Administrators can practically search on every possible data element and sort on every element to easily find and manage the complaints and it is blazing fast. Now that you have a fully loaded complaint box, is your facilities manager geared up to close all the complaints? Today, we announced our tie-up with Magic e-mart , a unit of Magic Online Business, to provide our Bangalore customers special discounts when buying groceries and other retail goods online. As a part of the tie up ApnaComplex customers will be provided discounts on top of all the listed prices by Magic e-mart. Please visit the ApnaComplex Advantage page to know details on utilizing this offer. Shopping online for your routine needs should definitely help you to avoid traffic, parking problems, and the long billing queues – not to mention the total time spent. By utilizing this offer, we do believe our customers can not only save money, but save time and effort. We hope this will be of very good value and offer great convenience for our customers. With this tie-up, we sure hope to have made life little better for you! If you are looking for sample template of bylaws for residential welfare association or apartment owners association, download from here. The primary responsibility of the Managing Committee of an Apartment Owners Association (or Residents Welfare Association) is to ensure proper maintenance of the Apartment Complex and to resolve any issues that residents face in a timely and effective manner. These are not easy tasks to handle when you consider the sheer variety of challenges that confront the committee. Convincing members to act in the interest of the society is no less a challenge either as almost every resident is aware of their rights but few accept their responsibilities. So how does a Managing Committee go about its day-to-day tasks, taking clear, unbiased actions that work in the best interest of the society? What are the powers of the Managing Committee that enables it to enforce its decisions? And what makes the members of an Apartment Complex accept these decisions? The answer to all this lies in the rules and regulations that every Apartment Complex adopts from the moment it is registered. Called bye-laws of the society, these rules and regulations govern the day-to-day functioning of the Apartment Complex. So crucial is the role of bye-laws in the smooth functioning of a society that many consider them to be the constitution of an Apartment Complex. The Co-operative Society Act is a Central Act that helps co-operative societies to manage their affairs. However, most States in India (Maharashtra in 1960, Gujarat in 1961, Karnataka 1960 and so on) have repealed this act and have created their own Co-operative Societies Act. These Acts specify the rules and regulations that are part of a model set and usually any residential Apartment Complex association is free to adopt these bye-laws in total or modify them as per their requirement and accept them. The Act thus offers a certain degree of flexibility to societies. details of how it will go about getting the co-operation of all members. information on how the society will manage its income and expenses. The bye-laws should also mention when and how the AGM of the society will be held. Usually the first AGM should be held within six months from the close of the financial year. From the second year onwards, it should be held every year after March 31 and before August 14 as per bye-law no. 95or within an extended period as per Section 75(i) of the act. An AGM can be held by giving at least 21 days prior notice to members. Once the bye-laws are adopted, the society can function forever with that particular set of rules. However, the bye-laws can also be amended by the government or the residents themselves if the need arises. For example, if the bye-law says that the tenure of the Managing Committee should be 5 years, the association can change it to 3 years or 7 years by getting it approved by the General Body and then the Registrar. The new set of amended bye-laws will become functional for the association from the date of approval by the Registrar. A General Meeting (annual/special) should endorse the change with a two third majority of the members present in the meeting. This two third of members should not be less than one third of the total members in the society. (The Registrar may still accept the amendment under such a condition if the reason for the low turnout is explained in writing). The Managing Committee should submit the form mentioning the new law to be brought into force. The Committee should also submit four copies of the existing bye-laws along with the resolutions passed by the Annual General Meeting. The date of the meeting at which the amendment was passed. The number of members in the association. Number of members of the present in the meeting. Number of members who voted in favour of the amendment. The Registrar will register the amendment upon satisfaction that the amendment does not contravene any Act or rules that guide the functioning of a co-operative society. On approval, the Registrar will issue a certificate of registration along with the certified copy of the amendment. This is proof of the amendment being successfully registered. The Registrar of Societies can, however, refuse to register an amendment of the bye-laws. The Registrar will provide the reason for the decision in writing to the association. The bye-laws are thus binding as well as flexible enough for the Managing Committee to manage the affairs of the association as best as possible. You can download a sample template of bye-laws from here. We released new feature of “Document Repository” in ApnaComplex today. Starting today, Administrators and members of a complex can upload documents of relevance in ApnaComplex secure repository. This shall enable the community members to easily locate association documents – such as bye laws, meeting minutes, welcome kits, photos, vendor quotations, contract copies, building plans, regulatory certificates and just about anything relevant. We believe that this shall help both the members and the managing committees as this greatly improves accessibility of data to everyone at any time. Any member can upload a document (up to 2 MB in size) along with a short description and select a relevant category. Members can search and sort for the documents based on the name, description, size or category making it easier to locate. No more issues of digging through emails or your personal desktops to find a particular document. Any member can view or download a document and Administrators will have the ability to delete documents to ensure a clean repository. With this feature, we sure hope to have made life little better for you! Budget 2010 revived what many thought was a closed chapter for millions of home buyers in India. Ever since it was introduced, there had been uncertainty about the government’s service tax on residential constructions and the manner in which it had to be collected. Following a circular in 2009, the issued seemed to have been laid to rest – though there was a lot of confusion on how the refunds were to be claimed. Now, Budget 2010 has brought the issue back into the limelight. Let’s take a look at the whole issue in detail. During the heady years of the construction boom which started around 2004, the government came up with a unique idea to augment its finances. It decided to levy a service tax on builders for offering their services to anyone who’s buying a residential or commercial property from them. The proposal came into effect from June 16, 2005 and a 10.2% tax (10% service tax and 2% education cess) was levied on 1/3 of the cost of sale price. The builders promptly passed on the burden to the buyers. Many of them started including this as part of their scheduled payment structure. Meanwhile, the builders association and various taxation experts called for the removal of this tax. According to them, land was a state subject and the Central government couldn’t levy any charges on it. They also argued that the nature of the transaction between the buyer and a seller is not of a service but of a sale. The builders also argued that it was hampering sales and creating unnecessary confusion in the minds of the buyer. The government responded with clarification that the taxation was not on “buying and selling” of the flats, but on the services rendered. If the construction activities were undertaken entirely by the builder or in cases where no service provider was involved, there would be no service tax involved. Plus, to protect the interest of small builders, no service tax was applicable for projects that had less than 12 units in it. b) In case of under-construction projects, since the buyer gets ownership only after its completion, it came under the exclusion provided in the definition of “residential complex”. There would be thus no service tax applicable on residential complexes. Following this circular, the amount collected as service tax was refunded under the provision Section 11B of the Central Excise Act. The refund was to be collected by individual buyers directly from the government or the builder could repay the buyers and then claim a refund by keeping evidence of the repayment. Fill application Form R and submit it to the jurisdictional ACCE or DCCE before the expiry of one year from the relevant year. Affix a revenue stamp after signing it. The application in Form R shall have valid grounds for refund. Proof should be submitted that refund would not result in unjust enrichment. Invitation for authorities to verify the accounts maybe attached. A Charted Accountant (CA) certificate that the Service Tax has not been passed on may also be obtained and submitted where the CA clearly specifies the books, records, payments received verified. When everyone expected the dust to have settled on this issue – Budget 2010-11 seems to have reversed the decision of the earlier circular by raising a claim for service tax on under construction residential complexes or completed buildings that have not received their occupation certificates. The budget had initially proposed a tax of 10% on 33% of the sale price. This was later reduced to 25% of sale price. So, if the apartment you’re buying costs Rs. 40 lakhs, then as per the Budget proposal, the applicable service tax would have been Rs. 137,333 (at the rate of 10% service tax and 3% cess on 33% of the property value). However, with the amendment, the service tax gets reduced to 103,000, resulting into savings of Rs. 34,333. The amendment also benefits those who are buying a low cost flat. For example, if you were buying a low cost flat worth Rs. 15 lakhs, then as per the Budget proposal, applicable service tax would have been Rs. 51,500. This has now becomes nil, as per the amendment announced. This tax will not be applicable if full payment is made after completion of the construction. Service tax is also not applicable where the builder is engaging his own contractors, designers and other service providers. In some states like Maharashtra, the buyer has to pay an additional 1% VAT on the cost of the flat. Builders have already started collecting the amounts from buyers and it’s causing a lot of resentment and distrust between them. With home buyers caught by surprise and the construction industry unhappy about it, experts believe it’s only a matter of time before the tax gets challenged again. Also, it’s not clear at what stage the service tax will be levied. Will it be at the time of registering the sale, during the documentation process itself or during the handover of the flat? There are too many unanswered questions for which both builders and buyers are trying to find answers. The ball clearly is in the government’s court on this one! This article is vetted by Mr. Deshpande R P, Director of Institute of Home Finance, the first of its kind institute dedicated to mortgage banking studies. Mr. Deshpande is a Mortgage Banking Professional with Civil Engineering background and has more than 25 years experience in Mortgage Banking sector. This article aims at collating and providing information on service tax for residential complexes at one place for benefit of ApnaComplex customers and readers. While ApnaComplex has taken every care to ensure the information is accurate, we suggest to please use it only as a guidance for further discussion and action with help of relevant professionals. If you need professional advise on this topic and any other property related matters, please send your request through our contact us form. You may post your questions/inputs in the Comments section below and we will try and get them answered through relevant subject matter experts.